Our friend Simon (the same Simon that hates tofu) is a man of set habits. Every Friday, he makes toad in the hole for supper. He has been doing this for about fifteen years now, and has developed some strongly held feelings about how the perfect toad is constructed. I quote directly from a very involved post he wrote about doing the Listener crossword a while ago – the toad recipe pops up somewhere in the middle when he gets briefly stuck on 29 across. Get a metal baking tin, preferably non-stick. Rectangular is best, about 30cm by 40cm. Put a pound of Tesco’s Finest Pork & Herb sausages in it, along with a large splash of vegetable oil (or a lump of beef dripping if you’re daring.) Put it in the oven at 200 degrees C (180 degrees if fan-assisted) – no need to preheat, just bung it in from cold. Put 4 oz of cheap plain flour into a glass jug. Add a pinch of salt, and break in an egg. Add about a quarter of a pint of full-fat milk, and whisk to a smooth paste – the best tool is a French whisk, those things that look like a big metal spring. Once you’ve got a smooth paste, add another quarter pint of full fat milk and whisk like mad to get some air into it. Leave to stand for 20 minutes, by which time the sausages should be browning and the fat should be hot. Melt the beef dripping in a frying pan and saute the sliced onions with the salt for about half an hour, until they are turning a lovely brown. Sprinkle the flour over and stir well to make sure it’s distributed well around the pan, and pour over the stock, stirring slowly all the time. Pour the wine in and bring to a gentle simmer for five minutes, until the gravy is thickened and the alcohol has burned off. Stir in the soy sauce and serve. I much prefer to use dark soy for gravy-browning purposes – those browning granules you can buy don’t add anything at all in the way of flavour, where dark soy will give a rich background (which doesn’t taste recognisably Chinese) to your sauce along with its great colour. These crisp, pink onions are a traditional Yucatan accompaniment for cochinita pibil, and oh, my beating heart, they’re good. Red onions are par-boiled very briefly, then semi-preserved in a citrus, sugar and salt mixture spiked with chillies and cumin. They’ll keep in the fridge for up to a month, which is good, good news, because besides being a perfectly pitched addition to a taco, these are one of the best accompaniments for strong cheeses I’ve come across. (Try some alongside a Stilton or some Gorgonzola.) They’re great to look at, too; the acid in the preserving mixture turns the red onion, which acts as a universal indicator, a really vibrant pink. I’ve used a little home-made habanero vinegar in the preserving mixture. It’s a particularly delicious vinegar (and very easy – just steep a few whole habaneros in a bottle of white wine vinegar for a couple of weeks) – it picks up all the citrusy, fruity undertones of the habaneros and packs plenty of heat. Halve the onions, and cut into slices. Bring a saucepan of water to the boil and drop in the onion slices. Count to twenty and drain the onions, and set aside in a large bowl. Stir the citrus juices, vinegar, cumin, salt and sugar together in a saucepan and bring to the boil, stirring until the sugar and salt has dissolved. As soon as the mixture starts boiling, remove it from the heat and pour it over the onions. Cover the bowl and refrigerate until cold (a couple of hours). My good buddy Caitlin, an Alaskan who is so horrified by Sarah Palin that she is seriously considering emigrating (rather than doing what the rest of us are doing and merely mocking her by dressing up in an overpriced red suit, beauty queen sash, shotgun and beehive for Halloween – possibly with a back-to-front B adorning our right cheeks), has tagged me for a meme. I don’t usually post at weekends, but this was sufficiently diverting that I thought I’d give it a whirl. Plush suction-cup Catbus (from Studio Ghibli’s wonderful My Neighbour Totoro, one of my top three movies ever. Pay little attention to this – I have the taste of an 80-year-old, so the other two are Singin’ in the Rain and Gone with the Wind). Note the plush testicles. And the sandy-toned fella top right. Here he is again – this is Mr Raffles, or at least part thereof, up close, ‘cos he’s also within two feet of me. Note the withered, empty (and yet delightfully furry) scrotum. Dr W couldn’t look him in the eye for about a month after this. A bottle of Angostura bitters. I have been making pink gins. Give me a break – it’s Saturday. One box liqueur chocolates. Empty. See Saturday comment above. (And note also depressed Mr Raffles, bottom left, who has just has his inadequacy pointed out to the whole Internet.) That’s Dr W’s bare foot top right. Ew. Gargantuan Las Vegas mug. It contains cherry juice (I’m done with the gin now). It’s a superfood, don’t cha know. This year’s poppy, bought this afternoon. Please think about buying one too. There are rules and everything appended to this lot. I’m not very good at rules and I like watching memes die, so I’m only tagging two people here – GSE, who is the UK’s best lunch companion, and Garfer, who says he wants to kidnap me in a helicopter. Have fun, fellas. 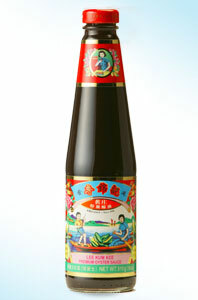 Despite the presence of shellfish, oyster sauce doesn’t taste at all fishy. It’s very savoury, and has a lovely sweet edge, but there’s no hint of fishiness, so you can serve this to fish-hating children (and adults) without needing to worry. Chopping your veg into slim batons shouldn’t take too long, and I actually rather enjoy the repetitive slicing – it’s somehow rather soothing at the end of a long day. Try to buy reasonably small courgettes – these will be sweeter, and their flesh will be denser and easier to chop. Heat a couple of tablespoons of oil in the bottom of your wok over a high flame until it begins to shimmer. Throw in the garlic, ginger and spring onions, and stir-fry for about thirty seconds. Tip in the carrot and courgettes, and continue to stir-fry for a 1-2 minutes, keeping everything on the move until the courgette pieces start to go bendy (bendiness is starting to occur in the picture). Pour the oyster sauce and wine into the wok and continue to stir-fry for two minutes. Add the cornflour mixture and keep stirring until the mixture thickens a little. Serve immediately with rice. This is an extremely tasty hybrid – American barbecue crossed with Chinese roast chicken. Regular readers may already have read my original beer can chicken post, and it’s worth glancing at it again for more on this cooking method, which is one of my favourites for roasting chicken. A can of beer is – how can I say this delicately? – rammed up the chicken’s bottom, and steams the bird from the inside while the outside roasts to a lovely crisp. Usually, I make chicken cooked in this way with an American-style dry rub. This time, I’ve made a Chinese paste to marinade and cook the bird in, and I’m very pleased with the results. I served this with some steamed rice and sweetly stir-fried carrot and courgettes – about which you can read more later in the week. Make a paste from the hoi sin, two teaspoons of the five-spice powder, 1 teaspoon of the sesame oil, and the ginger and garlic, grated. Rub it all over the chicken, both inside and out. Leave to marinade for at least three hours (I left mine overnight). Preheat the oven to 180° C (350° F), pour half of the can of beer into a glass and drink it, and use a hammer and nail to knock a few holes in the top of the can alongside the ringpull. Sprinkle the remaining teaspoon of five-spice powder into the can (be careful – it will fizz extravagantly, so do this over the sink). Put the can in the centre of a roasting tin. Cut the string holding the chicken’s legs together, pull them apart so it looks like it’s standing up, and push the upright chicken firmly onto the can. I use a very cheap stand, whose wires I’ve bent so you can fit them round the can, when I roast chicken this way – it helps keep the whole apparatus from falling over while it cooks. There is little dignity in death for chickens. Roast the chicken for 1 hour and 30 minutes (if you have a large enough barbecue with readily controlled temperature, cook it in there instead of the oven), and remove carefully from the can. Pour away the beer in the can – it doesn’t taste great. Rest the chicken in a warmed dish for ten minutes – it will produce plenty of delicious juices to go with any that have dripped into the roasting tin during cooking. Whisk the juices together with a teaspoon of sesame oil, and pour over the carved chicken. Garnish with some chopped spring onion and serve. Over at Simmer Till Done, the endlessly delightful and fragrant Marilyn has, for some reason, decided I’m a food blogger worth interviewing. Thanks very much again, Marilyn; I had real fun answering your questions. And I kind of agree with your reader’s comment about the Wolfgang Puck pizza…what can I say. Las Vegas does something awful to the volume switch in my brain that enables me to differentiate between what’s tasteful, and what’s encrusted with white tigers and rollercoasters. Go and have a read, and let me know what you think, people, and be gentle about the pizza thing. I write this with two of my friends in mind – Francis, whose tofu disintegrates, and Simon, who, on hearing that I was making something with beancurd in, said: “Ewww! Tofu!” – the sod. Now, unlike Simon, I’m lucky enough to have spent a childhood being exposed not to the vegetarian tofu-masquerading-as-meat school of cooking, but the Chinese sort, where tofu is a delicious addendum to meat. In this dish (whose name means ‘pock-marked old woman’s tofu’, just to put Simon off even further) the tofu isn’t treated as a blank sponge of protein to absorb flavour – instead, its own flavour, actually rather subtle, delicate and somehow cooling, is a contrast to an amazingly savoury, chilli-hot surrounding of soy, chillies and pork. Totally delicious, and it’s very easy to make – just make sure that all your ingredients are chopped and ready in bowls before you start to stir-fry, because you’ll have to move fast once you begin cooking. In a large bowl, mix the pork (I like quite a fatty mince here) with one teaspoon of the cornflour, the dark soy, sugar and Chinese wine. Set aside for a couple of hours in the fridge. While the pork is marinading, soak the mushrooms in the boiling water. 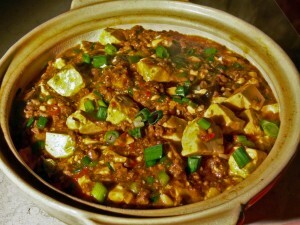 Chop the tofu into cubes about 2cm on each side and set aside in a bowl. Chop the garlic and ginger into tiny dice, slice the chillies finely, and put them all in another bowl. Chop the spring onions into small pieces and put the pieces from the lower, creamy and pale green half of the stem in the bowl with the garlic, ginger and chillies, and the pieces from the top, dark green half of the stem in a third bowl. When the mushrooms have soaked for half an hour, chop them into dice about the same size as the spring onion pieces, reserving the soaking liquid, and put the chopped mushrooms in the bowl with the garlic, ginger, chillies and the bottom half of the spring onions. When you’re ready to start cooking, heat a wok with a couple of tablespoons of flavourless oil in the bottom until it starts to smoke. Throw the pork and its marinade in, and stir-fry until the pork has browned and starts to look a little crusty. Add the contents of the ginger and garlic bowl, stir-fry for about twenty seconds, and add the chilli bean sauce. Keep stir-frying until everything is mixed well, and add the tofu with the soaking liquid from the mushrooms. Stir very gently to make sure everything is combined. Turn the heat down low and bring everything to a simmer – the tofu should be distributed evenly through the mixture. Don’t stir (this instruction is especially for you, Francis), or the tofu will break up – as it is, you’ll notice it breaks up a little, but the vast majority should stay in firm cubes. Allow the mixture to simmer for ten minutes, then add the remaining cornflour mixed with a little cold water (the water must be cold, or you’ll get lumps), stir very gently and simmer until thickened. Throw in the green tops of the spring onions, sprinkle over the sesame oil, and transfer to a bowl to serve. The pumpkins you buy for carving don’t have the sweet, chestnutty character of many of the smaller squashes, so they’re better kept for carving and putting on the windowledge. A pumpkin-type soup is better made with something like a butternut squash instead, which has a great flavour and texture, and can be a bit easier to handle than some of the rounder squashes. In this recipe, the vegetables that make up the soup are all roasted. The squash will caramelise nuttily, the peppers become sweet and silky…and surely, there can’t be anything nicer than a roast onion? I’ve topped the lot off with some gorgeously savoury, crispy garlic and parmesan croutons. Halloween heaven. Preheat the oven to 180°C (340°F). Peel the butternut squash and cut it into chunks about an inch square. Arrange them on a baking tray and drizzle generously with olive oil. Peel and quarter the onions, and put them on another baking tray, cut side up. Dot with the butter and drizzle with a little more olive oil, then sprinkle with salt. Put the squash and onions in the oven, and roast for 40 minutes, basting once. When the 40 minutes are up, put the peppers (on another baking tray, and rubbed gently with olive oil) in the oven, baste the squash and onions once more, and continue to roast everything for a further 20 minutes. The butternut squash should be soft and turning a sticky, caramel-brown at the edges, the onions should be browning nicely, and the peppers should be wrinkly. Set the squash and onions aside, and put the peppers in a plastic freezer bag. Seal and leave until the peppers have cooled. The steam coming off the peppers will loosen the skin and make them easy to peel – once cooled, you can slip the skins off. Saute the paprika and coriander in a tablespoon of olive oil in a large saucepan for one minute, then add the squash, onions and peeled peppers to the pan. Saute gently, stirring, for five minutes, then pour over the stock, and bring to a simmer for five minutes. Puree the soup in a food processor (you’ll need to do this in batches) and push the resulting puree through a seive, back into the large pan. Add the lime juice, which will push the flavour of the peppers to the fore, taste for seasoning and leave the soup to one side while you make the croutons. To make the croutons, preheat the oven to 200°C (400°F). Cut the crusts off the half loaf and discard. Chop the white part of the loaf into cubes about 2cm on each side (a large-ish crouton is nice here, the outside turning crisp and the inside retaining a bit of squashiness). Arrange the croutons on a baking sheet. Grate the garlic into the olive oil, mix well and drizzle over the croutons. Toss them well in the oil so every side is covered with the garlicky mixture, then sprinkle over the parmesan and toss again. Bake in the hot oven for ten minutes until golden, but start checking after eight minutes – these are quite easy to burn. Warm the soup through, sprinkle with croutons and garnish with a bit of fresh coriander. Given that we happened to be in Montreal for our wedding anniversary, visiting Toqué! was something Dr W and I didn’t stop very long to think about. The restaurant twinkles with a positive galaxy of stars from a number of awarding bodies, and has a reputation as one of Canada’s very best, specialising in Quebecois market cuisine – and you’ve already seen here just what kind of magic goes on at Quebecois markets. Toqué! only uses ingredients from passionate local suppliers (foragers feature here as much as farmers do), and something in the local character, water and weather in Quebec makes for some extraordinary produce. This is a serious fine-dining restaurant, with a wine list to die for, utterly gorgeous arrangements on the plate, service that falls over itself to make sure you have everything you want, and a wonderfully romantic dining room. Great company, too: Dr W is my far and away my favourite dining companion. If you’re planning on one of those special-occasion, intimate-conversation-type meals, I don’t think you could do a lot better than this lovely soft grey and mauve room, where you’re seated a good long way from neighbouring tables, ensuring privacy and quiet. The decor works with you here – gentle light comes from glass globes hung around the space, and the generous upholstery damps any noise from other diners, so your table sits in cocoon of quiet. Service excels too, attentive but not pushy, and my usual barrage of questions about cooking methods and sourcing met with grins and some excited conversation. I love it when the servers are as into the food as the people making it. It being a special occasion, we started with a tasting of two sparkling wines each (a starry Saumur and some toasty Champagne) before launching into the menu proper. I’d expected a couple of fizzy drizzles in small glasses, given the word ‘tasting’, but we ended up with two full flutes each – much joyful aniversary clinking ensued. The wine list is a fascinating selection from all over the world, ranging from those wines open only to those with fantasy expense accounts, to delicious but affordable bottles from the sort of small producer we barely get to hear about in Europe, let alone taste. When I’m in North America I try to order the kinds of wine that don’t get exported to the UK – here was a 2005 Chardonnay Village Reserve from Niagara (Clos Jordanne, for those of you who can get your hands on it), and it was a great contrast to lighter, Californian Chardonnays, so heavily oaked it was like drinking a buttery syrup. We decided against the tasting menu simply because some of what was on offer on the à la carte sounded too good to miss. Amuse bouches were a chilled shot glass of red pepper soup (again, have a look at the peppers produced in the area and weep for the plumpness and concentration of sunshine) topped off with a herb foam. El Bulli has a lot to answer for – these days foams, mostly insipid, pop up in all kinds of undistinguished places trying for the haute thing – but this was a densely flavoured, complicated and rich example, packed with herbs. We detected dill, chervil, mint, basil (at least – I’m sure there was plenty more going on in there) in this stuff, marrying gorgeously with the explosion of flavour in the soup. Dr W’s heirloom tomato salad was achingly sweet, full of that Quebec sunshine again. It arrived with a quenelle of white maize ice-cream, gorgeously smooth and tasting like distilled summer, razor-thin slices of sourdough fried in olive oil, and baby coriander leaves. I’d asked for the squash soup with shavings of foie gras. These were not so much shavings as a gargantuan heap, mi-cuit, butter-soft, and perfectly seasoned. Under the foie were wilted sorrel leaves, adding acidity to the smooth gloss of the soup and foie; hidden right at the bottom was a buttery, truffly cache of hedgehog mushrooms. Both of us had asked for suckling pig. Moist flesh with a crisp skin was surrounded by more seasonal ingredients – here were mousseron (fairy ring) mushrooms which seemed to have absorbed their own weight in butter; confit garlic; more of those sunshine-packed peppers (this time yellow and puréed); tiny, sugary champagne grapes; and something I didn’t recognise. Amazement. This is something that very seldom happens. The mystery objects were tiny, delicious buds, longer than capers and shaped like four-sided torpedoes, pickled in a sweet, spiced vinegar. I called over a waiter – what were these lovely things? Day lily buds. Things I frequently have in a vase at home, but had not considered eating. Chef Normand Laprise matches them perfectly with the rich and fatty pork. This is a preserve I really have to try making myself some time. Dr W went for cheeses rather than a dessert, each of which came with a different fruit preparation – a prune jelly on the Brie, pineapple membrillo on the Comte-ish Canadian cheese, strawberry leather on the Fourme d’Ambert and a piment d’Espelet in argan oil on the Gruyere-ish one. (My notes, as usual, become less helpful as the meal went on and I, like the lily buds, became more pickled – apologies for not being able to pin down the names of the two Canadian cheeses.) My poached pear came with a swirl of fruity, aromatic pistachio oil, which seemed to somehow insinuate its delicious self into every corner of your mouth. Pears, of course, are at their best at this time of year, and the accompanying foam and sorbet were so platonically pearsome that I found myself unusually speechless. 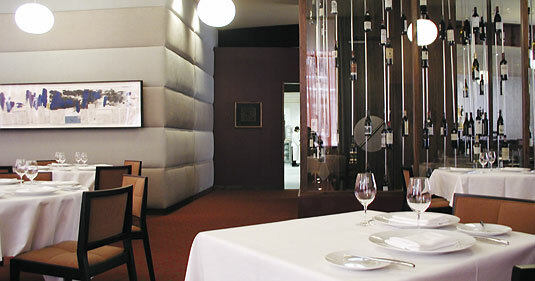 Meals this good – from food, to decor, to service, to sheer style – are not, of course, cheap. But we left agreeing that in ten years of dining out together (this meal marked the fact that we have now been married for precisely four of them), this was unquestionably one of the very best experiences we’d had. (“Top two or three, for sure,” said Dr W.) I’m unlikely to be able to return to Montreal for a few years now, but I look forward to our next visit – in a week there, we packed in a slew of the most enjoyable eating we’ve done in quite some time.